Be the first to share your favorite memory, photo or story of Mable. This memorial page is dedicated for family, friends and future generations to celebrate the life of their loved one. 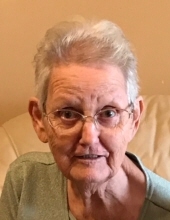 Mable Williams Cook of Douglasville passed away Monday, February 4, 2019 at her residence. She was born in Lockhart, Alabama, April 10, 1941, daughter of the late George Richard Williams and Lizzie Baggett Williams. Mrs. Cook was a member of the Seventh Day Adventist in Douglasville. She was preceded in death by her husband, William L. Cook and a son, Phillip Cook. Survivors include two children, Mable Diane Woods of Douglasville, William Franklin and Tona Cook of Bremen; a daughter-in-law, Candie Cook of Temple; two brothers, Larry and Kay Williams of Crestview, AL, Roy and Peggy Williams of Temple; six grandchildren, Deborah and Dean Gillespie, Becky and James Sticher, Alisha and Michael Monstvil, Matthew and Victoria Cook, Levi and Andrea Cook and Lee Cook; seven great grandchildren, Chase and Brittany Michael, Caleb Sticher, Logan Gillespie, Jade Watson, Skylar Watson, Lyla Gillespie, Will Monstvil and two great, great grandchildren, Carmyn Michael and Chloe Michael. The family will receive friends at the funeral home Wednesday from 4:00 until 8:00 PM. Services will be Thursday, February 7 at 2:00 PM from the chapel of Hightower Funeral Home with Mr. Curtis Woods officiating. Chase Michael, Lee Cook, Levi Cook, Matt Cook, James Sticher, Dean Gillespie and Michael Monstvil will serve as pallbearers. Interment will follow in Forest Lawn Memorial Park . To plant a tree in memory of Mable Williams Cook, please visit our Tribute Store. "Email Address" would like to share the life celebration of Mable Williams Cook. Click on the "link" to go to share a favorite memory or leave a condolence message for the family.